That's good news. But while there's nothing really wrong with the Eclipse Cross, and it drives as well as such a vehicle is likely to ("Zoom-Zoom" from some of the competition notwithstanding), it still manages to come off like a bit of a dog's breakfast, at least as far as its design is concerned. If you have a starving dog, then, you're in luck! Mitsubishi has unleashed its plug-in hybrid version of the Outlander and I have to admit it's the nicest Mitsubishi SUV I've driven to date. Not that a plug-in hybrid is near the top of my list of things to look for in a new vehicle, but judging by the number of plug-in hybrids available these days it seems clear that a) people either want such a vehicle or b) car makers are being pressured to add such vehicles to their offerings whether they sell or not (otherwise, why would we need government incentives that force your neighbours to help you pay for your purchase through their taxes?). Mitsubishi's "green" version of the Outlander has apparently been available elsewhere in the world for years, but this was the first model year the product has been offered to Canadian consumers. And according to the company, it appears Canadians are embracing the vehicle. 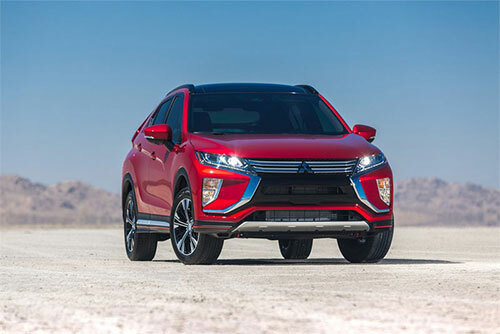 "With 598 units delivered in the month of July (2018), Outlander PHEV leads the plug-in hybrid segment with more plug-in hybrids sold year-to-date than any other nameplate", the company said in a release, "helping Mitsubishi Motor Sales of Canada to achieve its (sixth) consecutive best month sales record." Winter may be on its way out soon, but there's still enough of the "old person" around to ensure that snowy Canadian roads will be challenging for at least a few more weeks. That means there's still ample opportunity for more skid-related fender benders before spring springs and the grass starts rizzing. And to that end, Mitsubishi Canada has been on the road as well, bringing some professional drivers and some of their Outlander SUV/Crossovers to Alberta to not only showcase the "crummy weather capabilities" of their vehicles but to give some handy tips to attendees who find themselves oot and aboot when the white stuff sticks. Mitsubishi Outlander GT 4WD - control yourself! Mitsubishi's 2016 Outlander faces an uphill battle to be seen in the crowded midsize SUV/Crossover niche, despite many good things about the vehicle itself. It's too bad; at heart, the Outlander is a decent vehicle, but as executed on Mitsubishi Canada's sample GT 4WD version, there are some things that leave a bit to be desired - and that could help contribute to the Outlander's perhaps getting lost in the competitive shuffle. The driver's seat, for example. It's comfortable enough, but when I dumped my prodigious posterior into the sample's it rocked back as if it were mounted too loosely. This phenomenon would repeat itself when I tromped the gas pedal, which was quite disconcerting - though it did indicate that, if there are things lacking in this vehicle, power isn't one of them! Vancouver, B.C. – It sports a brand new set of clothes, a slimmer footprint and new technology. And it's one of the few small utes you can still get with seating for seven and V6 power. Take a basic four door sedan, add all wheel control and a touch of élan and you have the 2012 Mitsubishi Lancer, a compelling choice for those looking for a reasonably priced, reasonably fun family car. Well, the Lancer SE AWC, anyway. It's a new model for 2012 and the car Mitsubishi Canada provided as a sample. And you know what? It's a pretty nice ride. Mitsubishi i-MiEV – coal, natural gas or nuclear-powered eco-saver? Count Mitsubishi as being on board for saving the world through battery power. The Japanese automaker is one of the first companies to offer an honest-to-goodness all-electric car for the Canadian market, and I got to spend three days with one recently. It was the first all-electric car in which I've had a chance to spend some seat time, and of course I was very interested. One has a schnoz like Darth Vader's mask, the other looks like a legless frog on a skateboard, and the makers of both vehicles think they represent compelling solutions to customers' need for a small and capable crossover/wagon. It's raw! It's visceral! It's "Basic transportation on steroids"! If imitation is the sincerest form of flattery, Mitsubishi must really love Audi, Acura and Lexus. Here's evidence that one shouldn't be afraid of spiders, especially if they're spelled with a "y" instead of the arachnophobic's usual bane, "i". Want an affordable family hauler with a little more fun-to-drive quotient than many such vehicles? The Mitsubishi Lancer Sportback could be just what the doctor ordered.